Bomba Rice...not only rare, simply the best rice from Spain! Bomba rice is truly the most authentic rice for Paella..."Paella is not Paella without La Bomba Rice!". Bomba rice differs from most rice varieties in that it absorbs 3 times its volume in broth, remaining firm & delicious, & expanding to twice its length while cooking. Cultivated since the last century, Bomba rice is appreciated for its culinary quality by chef's & gourmands the world over. The Illa de Riu Bomba rice does not contain a single grain of other varieties & has a consistent flavor, texture, & appearance. The Bomba rice grains remain separate while cooking...never becoming sticky. 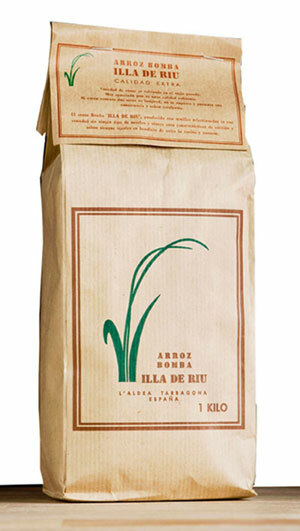 Bomba Rice is grown on the River Ebro Delta known as the Illa de Riu (River Island). The pure river water & the sublime climate of the island have produced a long tradition of premier rice production, Bomba Rice...the best of the best!!! Today, the third generation Trias family is dedicated to growing one of the regions premier, most appreciated rice varieties, Bomba Rice, under the brand name Illa de Rui. The Trias family produces its own certified seed rice & holds the title...Official Qualification of Seed Selectors, thus assuring maximum quality!!! Bomba rice...Enjoy! Bomba Rice: Arroz Bomba Illa de Riu L'Aldea Tarragona Espana. Produced on the River Ebro Delta( Illa de Riu (River Island).